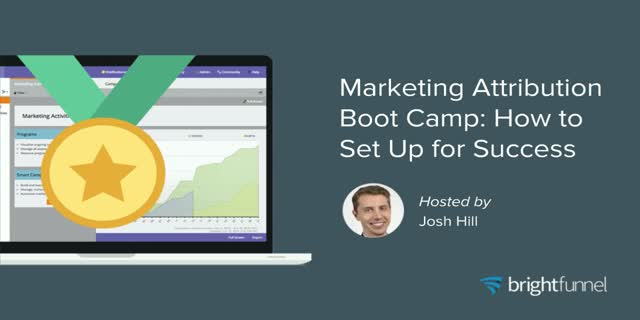 Hosted by Josh Hill, respected marketing technologist and author of Marketing Rockstar Guides, this webinar offers clear, tactical steps to help you set up your campaigns the right way. You'll learn how to set up your marketing automation and CRM for multi-touch attribution, the correct way to plan your channel-content mix, and what you need to put on your checklist to see marketing attribution success. Josh Hill is a marketing technologist who helps companies develop the infrastructure and strategies to achieve funnel transparency. Josh is the author Marketing Rockstar Guides; a resource for marketing technologists and Marketo users. Josh is an experienced sales and marketing professional with 15 years of service in technology, customer service, website development, business-to-business sales, and marketing. He has worked with dozens of firms to implement marketing technology and has trained marketers in Asia, Europe, North America, and South America. Josh is a Marketo Certified Expert, Marketo Certified Revenue Analyst, and Marketo Champion. Hear noted marketing technology analyst David Raab deliver clear steps on how to buy a B2B marketing attribution platform. During this 45-minute webcast, you'll learn why attribution is so important for today's marketers, what your options are, how to vet systems to find the best fit for your organization, and more. BrightFunnel is the pioneer in revenue attribution and forecasting for B2B marketers. For the first time, CMOs and their teams have a complete picture of Marketing’s impact on revenue. Through multi-touch attribution and intelligent forecasting, B2B marketers can now understand the revenue impact of every decision, and align marketing plans with business priorities. BrightFunnel’s clients are data-driven B2B organizations such as Cloudera, MobileIron, Invoca, Nimble Storage, New Relic and ServiceMax.